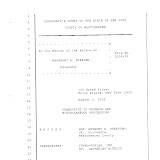 When 88-year-old Berta M. Murray died on August 12, 1997, she probably had not previously considered that the Scarsdale home built by her father, and that had been in her family for decades, would soon be occupied by a Westchester County Surrogate’s Court attorney-referee who worked in the very same court’s law department charged with the duty to oversee the affairs of the deceased-- A fact that has been secreted from her surviving relatives, until recently. 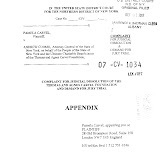 But Westchester Surrogate’s Court employee, attorney-referee Jody B. Keltz and her attorney-husband, Carl T. Peluso of Peluso & Touger in Manhattan, really liked that house at 168 Gaylor Road in Scarsdale, so in they moved in the Spring of 1998. And the two attorneys still call it home, even now as questions swirl as to just how they came to own the dead lady’s house. 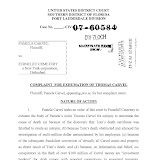 But an in-depth analysis reveals some eyebrow-raising facts, including that Berta’s last will was substantially different than her stated wishes as expressed to friends and relatives since her husband Elmer died in December of 1982. 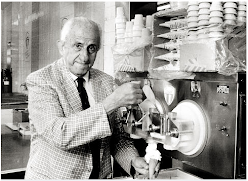 “In Westchester, everyone gets a crumb,” one estate lawyer noted. 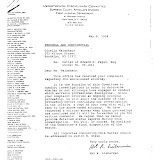 But those associated with the “new” wishes of Berta Murray EACH received “crumbs” worth tens of thousands of dollars: (1) attorney W. Rowland Miller of the Judy, Miller & O’Connor law firm in Scarsdale, and who drafted the Will for Berta (and in which The Bank of New York is named as the new fiduciary), and who was then retained as the attorney for the fiduciary, The Bank of New York; (2) attorney Samuel S. Yasgur, then of the Hall Dickler law firm, and who was appointed by former Hall Dicker lawyer and then-Judge Emanuelli to represent “unknown heirs”; and (3) real estate agent Camille Paradise of Claire D. Leone Real Estate, who lived in Berta’s neighborhood and who was the realtor that handled the sale of the house to court employee Keltz and her husband. Another serious criminal allegation against Jeanine Pirro has been added to the growing list of federal questions into her actions while Westchester County’s District Attorney, say sources familiar with the latest inquiry. 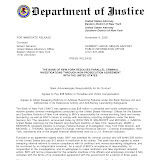 During her 12 years in office, according to the allegations, then-District Attorney Pirro knowingly failed to recover millions of dollars in forfeited bail-- monies that, according to state law, should have gone into Westchester County government bank accounts. After months of bitter infighting, Ninth Judicial District Administrative Judge Francis A. Nicolai (See Profile) has reassigned all four judges who have been hearing divorce cases in Westchester County. Two of five referees assigned to the matrimonial part are also being given new assignments, and the format for the matrimonial part itself is being revamped, said Office of Court Administration spokesman David Bookstaver. Three new judges will be transferred into the part starting today, he added. The judges are being shuffled and the part reorganized, Mr. Bookstaver said, because court officials have learned "from the nature of matrimonial work that it is historically prudent to rotate judges." When the changes are fully implemented, the matrimonial part, which decides approximately 900 contested divorce cases a year, will have one fewer judge and two fewer referees. The change in format, which will be phased in, will result in judges handling their own cases from start to finish, Mr. Bookstaver said. 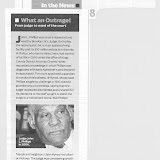 For the time being, though, judges assigned to the part will supervise cases until a fact issue is ready to be tried. At that point, cases will be assigned to any judge or referee in the part, or one of two backup judges, to conduct a fact-finding hearing. Two of the judges being reassigned will continue to conduct fact-finding hearings during the transition, Mr. Bookstaver said. 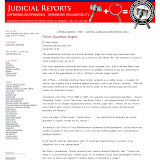 He added that no date had been set for the completion of the change in court procedures. Westchester Surrogate Anthony A. Scarpino, who is coming into the part as supervising judge, will not carry his own inventory of cases, Mr. Bookstaver said. 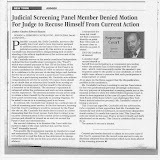 Surrogate Scarpino (See Profile) replaces Justice W. Denis Donovan (See Profile), who was responsible for assigning cases out to trial and hearings twice a week, and also carried a calendar of post-judgment enforcement motions. The rotations are related to the controversies that have swirled through the part in recent months. Without being specific, Mr. Bookstaver said that the public has raised "a number of issues about the part's practices and policies and the changes are designed to address those serious issues." 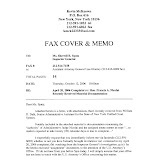 Mr. Bookstaver would not discuss details, and said he could neither confirm nor deny whether investigations had been conducted by OCA Inspector General Sherrill R. Spatz. 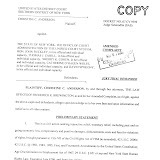 But a referee assigned to the part, James A. Montagnino, has made available to the Law Journal a letter he wrote on March 13 to Chief Judge Judith S. Kaye and five other top administrative judges complaining that Justice Nicolai had improperly intervened in cases on seven occasions after having had ex parte contact with a lawyer or litigant. 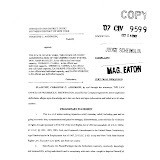 And in interviews, both Mr. Montagnino and his lawyer, Fred L. Shapiro, a former County Court judge, said they had met with Ms. Spatz, who was conducting an investigation into the charges raised in Mr. Montagnino's letter to Judge Kaye. Mr. Montagnino separately said that about a week after he wrote his letter, Ms. Spatz informed him that her office would be investigating complaints lodged against him by a number of female litigants whose cases he had handled. Other than Ms. Spatz, no agency has jurisdiction to investigate such charges. 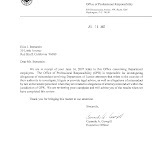 With regard to the investigation of Mr. Montagnino, Mr. Shapiro said that on June 5, Mr. Montagnino was told at a meeting with OCA's director of human relations that Ms. Spatz's investigation had resulted "in no negative findings." 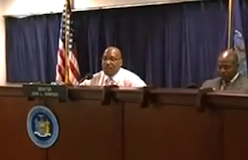 But he said OCA proposed that Mr. Montagnino accept a transfer to the Bronx because "it would be better for everyone if he did not continue to work in Westchester." 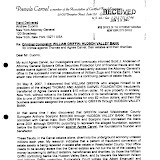 Mr. Montagnino, in turn, asked for a transfer to the Albany area because he could move to his vacation home in Saratoga, Mr. Shapiro said, and it was agreed he would be given an assignment in either Albany or Rensselaer county. 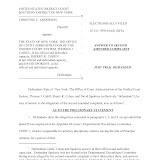 Mr. Bookstaver said that Mr. Montagnino was one of two referees who is being transferred out of the matrimonial part, and that starting today he will be assigned in the Third Judicial District, which includes Rensselaer and Albany counties. 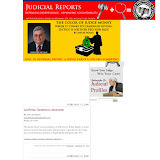 To the extent that no public action has been taken against Justice Nicolai, and he remains as administrative judge for the five-county Ninth Judicial District, it can be inferred that Ms. Spatz found no merit to Mr. Montagnino's complaint. 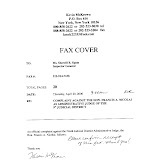 As for the ex parte issues raised in Mr. Montagnino's March 13 letter, Mr. Bookstaver said that dealing with complaints from litigants and lawyers is "a part of what administrative judges do — it is very much a part of the administrative judge's responsibilities." 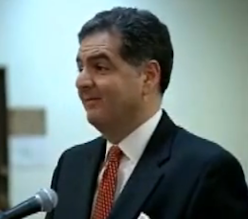 Like Mr. Montagnino, Judicial Hearing Officer Edward P. Borrelli was reassigned as part of the court shakeup. Starting today, Mr. Borrelli will be working in the commercial part of the Westchester courthouse. The three other referees who had been assigned to handle fact-finding hearings and occasionally whole cases, will now each be paired with one of the new judges handling divorces. In their new roles, they will be sent "narrowly framed issues" to try, and also handle conferences and motions in cases assigned to their judges, Mr. Bookstaver said. The three referees who will continue to do matrimonial work are Meryl Amster, Irene Ratner and Reynold Snyder, though he is also slated for reassignment. 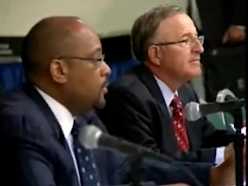 Mr. Bookstaver said that Mr. Snyder will be replaced after he is reassigned. 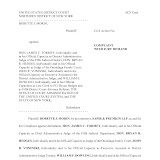 The four judges being reassigned from the part are Justices Donovan, Bruce E. Tolbert (See Profile), Richard B. Liebowitz (See Profile) and William J. Giacomo (See Profile). 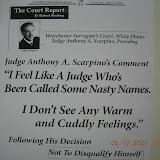 In addition to Surrogate Scarpino, the judges coming into the part are Westchester Justice Linda Jamieson (See Profile), a former divorce practitioner and Family Court judge, and Justice Lewis Lubell, a plaintiffs' personal injury attorney who was elected to the bench from Westchester County last November but who has been sitting in Orange County. Justice Lubell will be replaced in Orange County by Justice Joseph Alessandro (See Profile), who is being brought in from Rockland. Matrimonial bar leaders in Westchester expressed concern that the changes will leave them with one fewer judge and two fewer referees. They also said they were caught short by the changes. 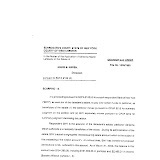 Neil A. Fredman of Fredman & Kosan, who until May 17 was the head of the family law section of the Westchester County Bar Association, said that he had first heard "rumblings" of the planned changes two weeks ago. 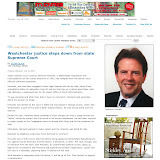 Mr. Fredman said that, even though the family law chairman historically has served as the liaison between the Westchester matrimonial bar and matrimonial judges, he had received no communication from the court about the proposed changes. Mr. Fredman said that he was "mystified" as to why OCA was reassigning the judges. "There were charges and countercharges flying all over the place," he said, and the "only visible result is that all the judges are gone — and the complaints had nothing to do with them." 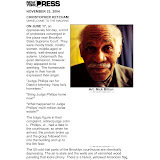 The bar fought hard to have more referees and a fourth judge added to the part, Mr. Fredman said. 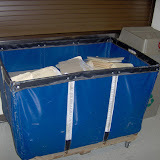 Now that they are gone, he added, "we will certainly be pressing to get them back." 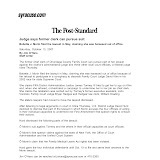 Lonya A. Gilbert, a co-chairwoman of the Westchester women bar's matrimonial committee, said, "Our clients are required to come to preliminary conferences, and we already often have to wait a half hour. This certainly won't make the situation any better." The dustup in Westchester has also had reverberations in Orange County, where lawyers are upset over the loss of Justice Lubell. 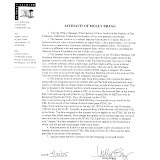 Joseph A. Owen the immediate past president of the Orange County Bar Association, said his association had written to Justice Nicolai asking that Justice Lubell not be reassigned, but was advised in a phone call that the transfer "was already done." Justice Lubell, who was elected to the Supreme Court last November, was "a real gem," Mr. Owen said. "With his experience as a trial lawyer, he was able to move cases expeditiously and fairly," and both sides of the personal injury bar "appreciated having him on their cases." Jonathan Jacobson, the Democratic leader in Orange County said he had contacted both Chief Administrative Judge Jonathan Lippman (See Profile) and Justice Nicolai, asking them not to reassign Justice Lubell. Mr. Jacobson said he had gotten "lots of calls from Democratic and Republican lawyers alike expressing extreme displeasure" at Justice Lubell's transfer. They all felt, he said, that Justice Lubell had not "forgotten that he was a lawyer once, and understands the needs of lawyers." 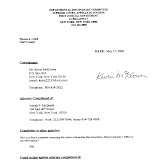 The infighting that led to the eventual shakeup in Westchester are reflected in the complaints against Justice Nicolai that Mr. Montagnino made in his March 13 letter and were mirrored in a complaint he filed nearly two weeks later with the state Commission on Judicial Conduct. 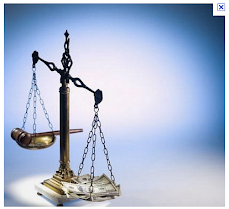 Both the letter and complaint asserted seven instance of improper ex parte contacts in six cases. 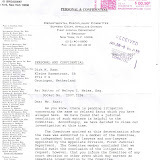 In addition, Barry Skwiersky, court attorney to Justice Giacomo, complained separately to the commission about Justice Nicolai's intervention in two of the cases cited by Mr. Montagnino, which had also been handled by his judge. 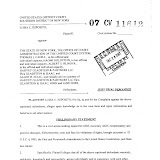 Mr. Montagnino's attorney, Mr. Shapiro, who handled matrimonial cases in Westchester for eight years, filed a third complaint with the commission in which he offered added factual support concerning three of the alleged episodes of improper involvement by Justice Nicolai. In two of those episodes, Mr. Shapiro claimed to be relaying information provided by Mr. Borrelli, who is a member of the court system's Advisory Committee on Judicial Ethics. 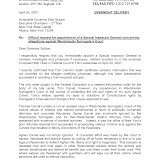 According to Mr. Shapiro, Mr. Borrelli complained about two instances of ex parte intervention by Justice Nicolai in a divorce case that he was handling. Mr. Borrelli declined to comment. Mr. Shapiro said that, as far as he is aware, his and Mr. Montagnino's complaints are still pending before the commission. 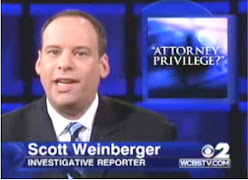 Mr. Skwiersky also said he believed his complaint is still pending. Under conduct commission procedures, complainants are advised of how their complaints are disposed. 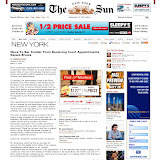 As for the complaints against Mr. Montagnino that he was biased against women, many matrimonial lawyers sent letters to Ms. Spatz's office attesting that he "was not a sexist," said Mr. Fredman of the Westchester bar. The outpouring of letters — one source said there were upwards of 30 — reflected a strong level of support. 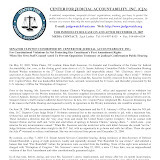 Kathleen Donelli, another co-chairwoman of the Westchester women bar's matrimonial committee, for instance, said Mr. Montagnino is "always fair to women and women's issues and has the utmost respect of both male and female attorneys." But some lawyers have a more negative view. 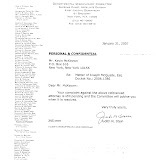 Carol Most, a lawyer who was cited by Mr. Montagnino in two of his alleged examples of ex parte contacts, publicly criticized him as being "unfair" to women at a meeting of the Westchester women bar's matrimonial committee in 2003, according to Ms. Donelli, a partner at McCarthy Fingar in White Plains. Ms. Most, who at the time was a co-chairwoman of the committee, declined to comment. 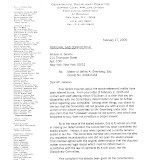 The leadership of the women's bar was so upset that its president at the time, Kathy N. Rosenthal, wrote a letter to Justice Nicolai disavowing Ms. Most's remarks, Ms. Donelli said. Though the letter did not mention Ms. 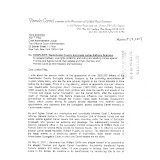 Most by name, Ms. Rosenthal stated that she was aware that "one or more members" of the association had expressed "an opinion" regarding Mr. Montagnino. She then noted that the association had not given authority to anyone "to speak about or against Referee Montagnino." Several Westchester matrimonial practitioners identified a small group of lawyers as being highly critical of Mr. Montagnino. None of those lawyers responded to requests to speak about their views, even on a not for attribution basis. 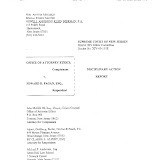 But other lawyers who are aware of their views, described the group as believing that Mr. Montagnino is not favorably disposed to wives with high-end lifestyles who are seeking to maintain those lifestyles, without having to re-enter the work force, through a liberal award of maintenance. 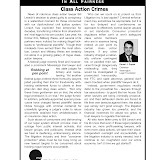 Comments that Mr. Montagnino made during a continuing legal education seminar at Pace law School in 2004 resonated with the critics, some lawyers said. 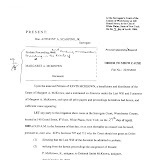 Referring to the zip code for Scarsdale, 10583, Mr. Montagnino described some women litigants as having outsized and unrealistic expectations of what they can obtain in divorce, a phenomenon he dubbed the "10583 syndrome." 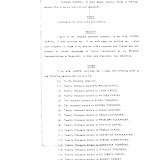 A reading of the full 10-paged, single-spaced transcript of the session, however, reveals other passages that would definitely be helpful to the non-monied spouse. 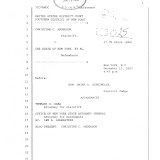 A couple of episodes illustrate the tensions that have marked the conflicts within the court, one involving Mr. Montagnino and one involving Justice Nicolai. Mr. Montagnino acknowledged in an interview that the day after Ms. 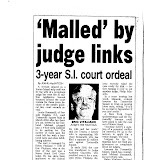 Most spoke at the 2003 womens' bar meeting, he bumped into her in the courthouse and asked her to come to his chambers. He said he told Ms. 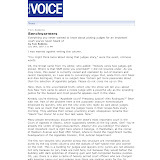 Most, who denied making the remarks attributed to her the night before, that making a false statement that a judicial officer is biased could constitute professional misconduct. 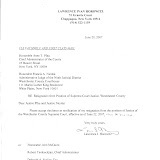 In a similar vein, both Mr. Montagnino and Mr. Shapiro charge that Justice Nicolai contacted court officials in charge of assigning counsel in Family Court cases after a well-respected law guardian complained that Justice Nicolai had intervened on an ex parte basis in a case where she had been assigned to be the law guardian. 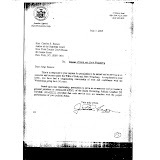 Justice Nicolai then forwarded Ms. Hannon's letter to the officials who certify lawyers for court appointments in Family Court cases in the Second Department with the notation "for whatever action you deem appropriate." 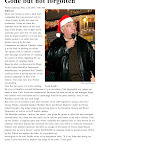 Ms. Hannon, apologized and that was the end of the matter, the source said. Ms. Hannon did not return a request for comment. — Daniel Wise can be reached at dwise@alm.com. WASHINGTON, Feb. 20 — The United States Supreme Court agreed on Tuesday to review New York’s method of selecting candidates to its own Supreme Courts — the 324 judges who have general trial jurisdiction throughout the state and whose nomination to 14-year terms is tightly controlled by a political process that two lower federal courts declared unconstitutional last year. The lower court rulings, which were stayed until after the 2006 election cycle, have created turmoil in the state’s judicial politics and spurred calls for fundamental change in a system that dates to 1921. The political parties control the nominating conventions, and candidates who are not favored by the parties’ leaders have no chance of getting on the ballot. The actual elections are for the most part uncontested. From 1994 to 2002, these nominating conventions in the state’s 12 judicial departments chose 568 State Supreme Court candidates, none of whom were challengers to the party favorites. 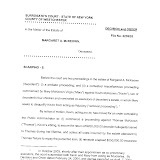 The United States Court of Appeals for the Second Circuit, in a ruling last August affirming a decision issued five months earlier by Judge John Gleeson of Federal District Court in Brooklyn, ruled that the system was so exclusionary as to violate the First Amendment right of the state’s voters to freedom of political association. 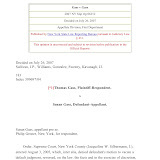 The ruling was appealed to the Supreme Court by the New York State Board of Elections, joined by several political organizations; the incumbent State Supreme Court justices; and by Attorney General Eliot Spitzer, who was governor-elect by the time the appeal reached the court on Nov. 28. 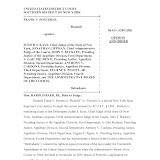 Governor Spitzer’s office in Albany said on Tuesday that he would have no comment on the Supreme Court decision to hear the case, New York Board of Elections v. Torres, No. 06-766. The court will take up the case when its next term begins in October. It could be a year from now, or longer, before the justices issue a decision. That long waiting period presents considerable uncertainty. Under Judge Gleeson’s original ruling, the state will have to begin to use a primary election system unless it comes up with another way to satisfy the court’s constitutional concerns. A bill to establish primary elections as the way to choose State Supreme Court nominees passed the State Senate last year and was reintroduced at the beginning of the new session in January. 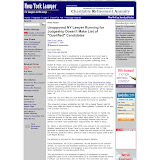 A task force convened by the New York City Bar Association in response to the court rulings recommended a system of merit selection, under which bar associations, civic groups and others would screen and present a list of candidates from which the governor or, in New York City, the mayor would choose. 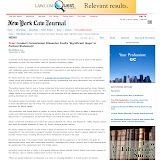 Mark H. Alcott, president of the New York State Bar Association, said on Tuesday that the organization had long supported a merit selection system. The shift to such a system would require a state constitutional amendment. 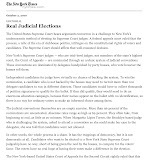 The Constitution was amended in 1846 to require election of State Supreme Court justices.